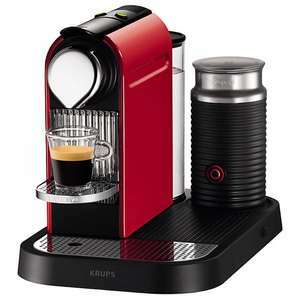 It is normally 3 lots of £25 credit, use one £25 credit at Nespresso and then they send the next one etc. Is it actually £75 reward or up to £75 reward. It is proper! ! ! ! I have the Expert machine after **** around for days it would not work, turns out nine of my Android devices will pair via the app so used an iPod worked first time. 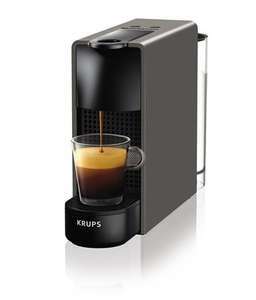 Anyhow when it works pretty cool, allows allot of control over your coffee and the schedule function is super. You can capsule count so you know when to reorder, gives descale and pod/drip trays alerts. All in all early days, major areas that need to improve, needs a capsule loader as current guise only one capsule can be preloaded. Then WIFI to check/schedule around the world. App is still flaky, you can tweak temperature, water and coffee fill amounts but keeps failing to remember. Bottom line potential but work to do, maybe even a Google Home link, oh yeah got that packed to return AGAIN !!! Thank You. I doubt I will use the Bluetooth really although love my gadgets so can only be a good thing I guess. Sounds like a great deal though questionable the value of a connected coffee machine as they hardly take any time to heat up and brew and we use different caps for each delivery so even preloaded calls wouldn't make sense. Good deal nonetheless have some heat, and it's a cool looking machine! She was great as Tiffany in Enders! So glad she's got into the saucepan sales trade. Go girl! Heat for her hotness alone. Great handles! I always wondered what happened to Martine Mcarthurglen after she kissed the Prime Minister. 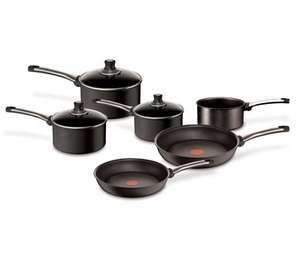 This is the induction set. On sale at the Tefal shop, Gloucester Quays. The price includes an additional 15% off because the shop is closing down. second hand fat fryer, lovely. Still any left at dalton park? ​are you sure you are sane? Cheers OP, got a black Actifry 1kg for £68.99 (the white ones are £59.99), we've been wanting one for a while. Also picked up an Optigrill for £39.99. Both appear to be brand new, no signs of use on either. Used it last night, came in brand-new condition and cooked absolutely brilliantly. Brilliant buy. I'll be down there tomorrow. Heat added. Thanks. All - I can confirm that the £60 model is the AL806041, which goes for £115 in major retailers. This IS a factory refurbishment with a 12-month warranty. Still a really good price however. I will update main article to reflect this. Yes but you can't get it on Amazon for £75 now! no time machine jokes from me about it. 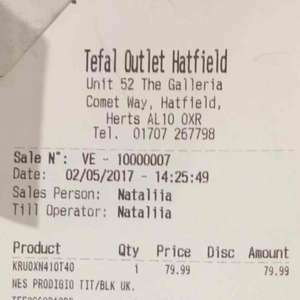 HUKDDUDE: it's at the TEFAL Braintree store. am I missing somet flamedeer? what's that? You actually put flamedeer in the title, desperate! I got a 32" in Asda for £12 the other day. In morrisons 28cm £8 and 32cm £9. Garbage, please don't believe any positive reviews. More trouble than they are worth. Real back of the cupboard rubbish. Defo Blue, a copper type colour and perhaps red? tefal actifry £99.99 but 15% off untill jan 1st. they,ll even fry you some chips in store . hmmmm chips. I think that we have used it for 3 out of 7 meals so far, sausages did well in it with some potato wedges at the same time as the excess fat from the sausages made the wedges very crisp. We are still experimenting. It can depend on the sausages themselves, some come out great, (usually if not a high fat content), whilst others come out awful. I have also gone back to grilling now because of the uncertainty. Yes - lots in store - until tomorrow for the 15 percent offer. If you want enough chips for 2 adults and 2 kids, then 750g does the trick in our house - fresh, cut from potatoes, but they need to be washed thoroughly to get the starch out them, and then dried as best as possible or they will not go crispy. The actifrying time is around 35 minutes for these. If you fill it with the max 1kg of fresh cut chips then it will definitely take around 40-45 minutes. But they do taste great! Unlike the sausages which we found were absolutely rank rotten - back to the grill for us.